The Moroccan-EFTA free trade agreement does not cover Western Sahara, according to Norwegian and Swiss authorities. This will have multi-million euro consequences for a firm that systematically mislabeled Western Sahara imports as Moroccan, and illustrates how the European Commission is on collision course with rest of the international community. “Since Morocco does not exercise internationally recognised sovereignty over Western Sahara, Western Sahara is not seen as a part of Morocco’s territory in relation to this agreement. The Free Trade Agreement is thus not applicable to goods from Western Sahara”, stated Norwegian Minister of Foreign Affairs, Mr. Jonas Gahr Støre in Norwegian Parliament yesterday regarding the Free Trade Agreement between EFTA and Morocco. The clarification from the Minster follows an import scandal that has been unrolled in Norwegian media over the last weeks, involving the president of the Norwegian business association, millions of euros in tax evasions, ministers and refugees. As a result of the affair, it has become clear that the practice of EFTA is in stark contrast to the policy fronted by the European Commission on trade with goods from occupied Western Sahara. The European Free Trade Association (EFTA) in 1997 signed an association agreement with Morocco. Exports from Morocco to the four EFTA states was thus made far easier, but created a loophole, giving importers a chance to export products from occupied Western Sahara free of duty if mislabeling the imports as ‘Moroccan’. And this is exactly what happened in Norway. A leading importing firm secretly purchased fish oil from Western Sahara for use for aquaculture industry for a decade. The Norwegian fish oil importer, GC Rieber, by mislabeling 12-20.000 tonnes of Western Saharan fish oil annually as ‘Moroccan’, failed to pay customs to Norwegian authorities for perhaps as much as 50 million euros. The reason for the tax difference, is that Norway does not recognise the Moroccan annexation of Western Sahara. Both Norway and Switzerland, the 2 biggest EFTA states, have stated that the EFTA free trade agreement with Morocco does not apply to products originating from Western Sahara. The affair in Norway did not get less controversial considering that the importer was owned by the President of the Confederation of Norwegian Enterprise, and that its customer in Norway has been chaired by the current Minister of Finance. During the last few weeks, the president of the Confederation has resigned over the affair, his company is under investigation by the Norwegian Ministry of Finance, while the Minister of Finance himself, Mr. Sigbjørn Johnsen, recently was replaced by a another member of government for matters in which his impartiality might be questioned relating to this specific case. In an answer to the Conservative Party of Norway, the Minister of Finance last week stated in parliament that he did not know about the imports during the years he chaired the company. The commerce has taken place in disregard of the policy of the Norwegian government. 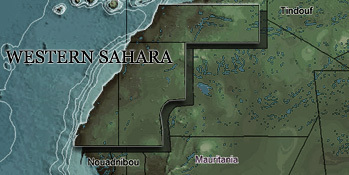 The Norwegian government asks Norwegian firms to not get involved in business in the territory, and got involved to stop the imports from Western Sahara to Norway. The imports to Norway of fish oil from the occupied territory, amounting to up to 17 million euros/year terminated in April. By clearly excluding Western Sahara territory from the application of the Free Trade Agreement, Norway applies the same interpretation as the other major EFTA country, Switzerland. ”Since Switzerland does not recognise the Moroccan annexation, the free trade agreement between EFTA and Morocco is not applicable for Western Sahara”, stated Martin Zbinden, Head of Free Trade Agreement at the Swiss State Secretariat for Economic Affairs in 2007, when the Swiss Western Sahara committee, ARSO, investigated Swiss tomato imports. The EFTA, "the EU light”, consists of four European countries; Switzerland, Norway, Liechtenstein and Iceland. The association works parallel to the EU, but still closely connected to its bigger brother. EFTA was originally established in 1960 on a UK initiative. By excluding Western Sahara, EFTA is thus is much more clearly following the UN than the EU. No states in the world recognise the Moroccan annexation of Western Sahara. The EU, however, is divided over the issue of trade with the territory. Although the UN and European Parliament lawyers states that economic activity in Western Sahara is in violation of international law, the European Commission supports economic affairs in the territory through a deliberate misinterpretation of a UN advice from 2002. This policy is mainly due to pressure from a small number of EU states with large economic investments in the occupied territory, and with close ties to Morocco. “The EU pays the Moroccan government for fishing in waters that do not belong to Morocco. It is a unique situation in EU fisheries, implying a systematic misuse of EU taxpayer’s money. The Spanish fishing fleet is in practice subsidised by the richer EU states for violating international law in the territory”, stated Sara Eyckmans, coordinator of Western Sahara Resource Watch. “The EU should look to EFTA and the USA, which both exclude Western Sahara from its free trade cooperation”, stated Eyckmans. The EU supports its fisheries in occupied Western Sahara by referring to a UN statement from 2002. The Commission has repeatedly misquoted the UN statement, causing the author of the 2002 opinion himself, the former UN undersecretary general for legal affairs, to say he is “embarrassed to be European”. Read about the former UN legal counsel’s anger at the European Commission here. Some EU states oppose the Commission’s opinion, believing that EU cooperation with Morocco should not extend to Western Sahara, a territory which the UN still works to decolonise.